"Aimer et être aimé est le plus grand bonheur." That phrase is what is etched onto my ring. The silver band says aimer on the outside and et être aimé on the inside. My other band has 48.8704° N 2.3848° E engraved on it, but will we save that for another time. It translates to: to love and be loved is the greatest happiness. I place that ring on the middle finger of my left hand, to place that message for safekeeping. I have had this ring for many years; I have loved it for just as long. A few years back, I would wholeheartedly say that the reciprocal nature of the saying is what made me gravitate towards it. Wearing it for years and having my heart feel different kinds of fullness and heartbreak, my agreeance with this saying has change, though my affinity for it remains the same. 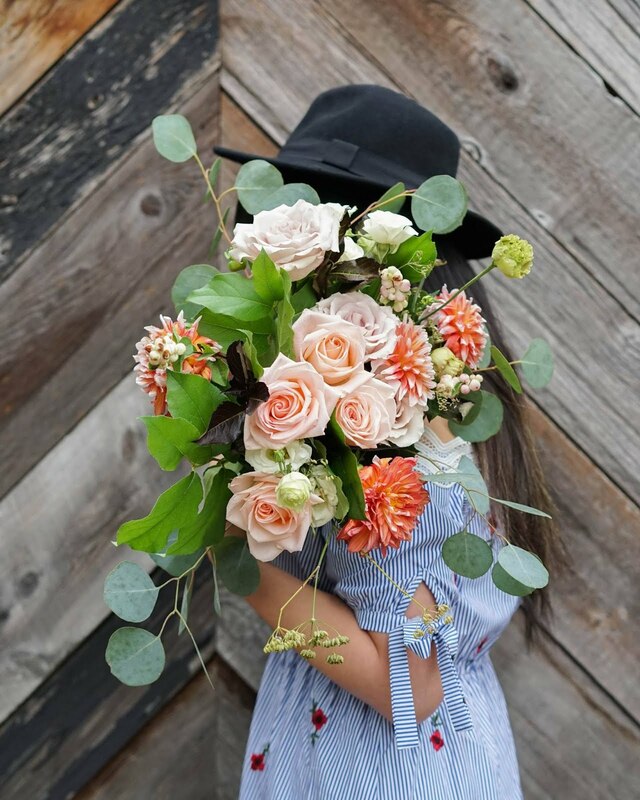 Loving is where I find the greatest joy; to find something or someone that makes your heart realize that this right now is the experience most people wait lifetimes for. Something or someone that makes you stop scouring the world because it now feels like there are worlds within you. Now I would say aimer is why I still wear the ring. To love is the greatest privilege. To love in heavy consonants and long vowels. To love in the litany of many little things. To love in the presence of you. I went berry picking two weeks ago! 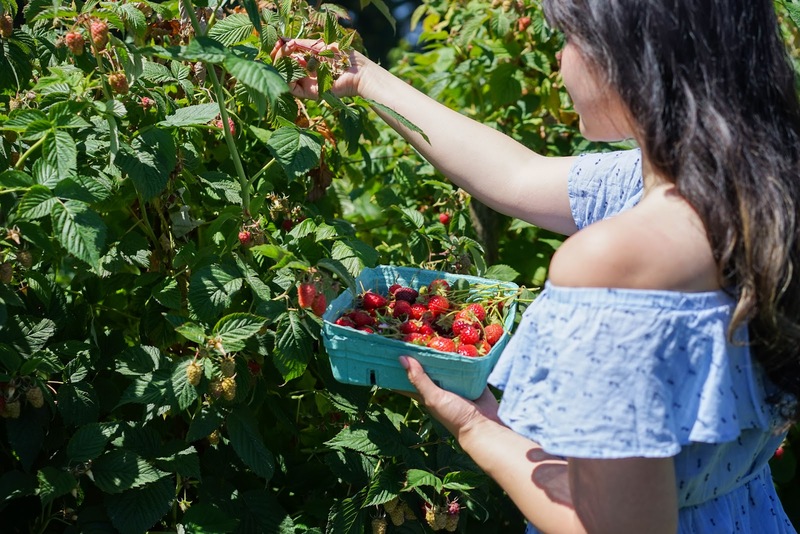 I was a bit hesitant to go strawberry picking because it was the tail end of strawberry season and when I called the berry farm and they said they could not guarantee that there will be any good berries left. 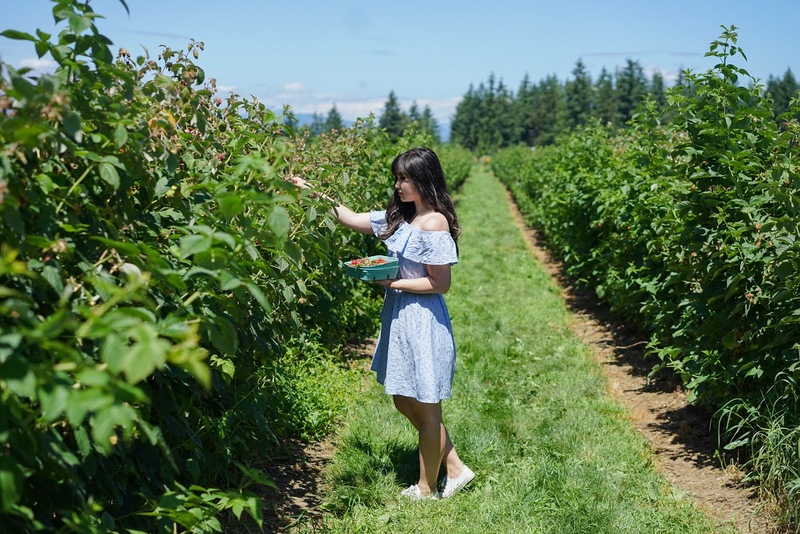 I was keen on going to this specific farm because I knew they served ice cream made with berries from the farm and fresh berry waffles made to order in their cafe. 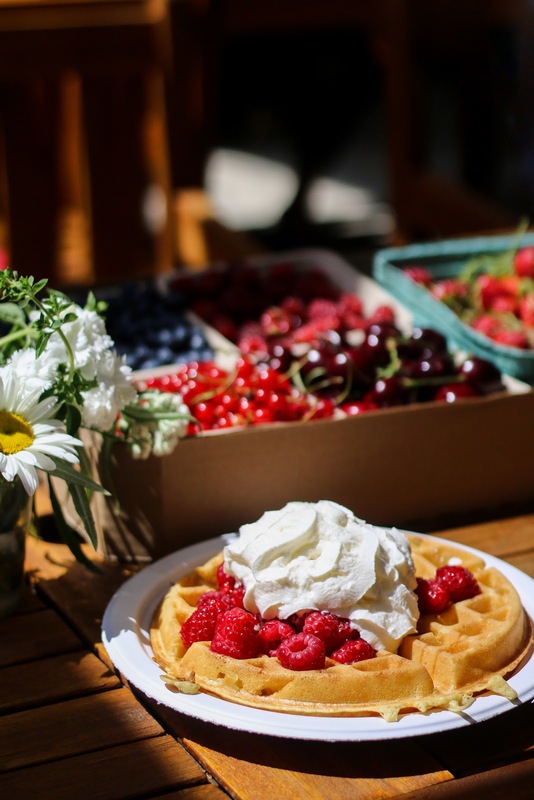 My boyfriend convinced me that even if we don't get any strawberries, I would still have a great time buying berries from the farm market and enjoy the treats at the farm cafe. 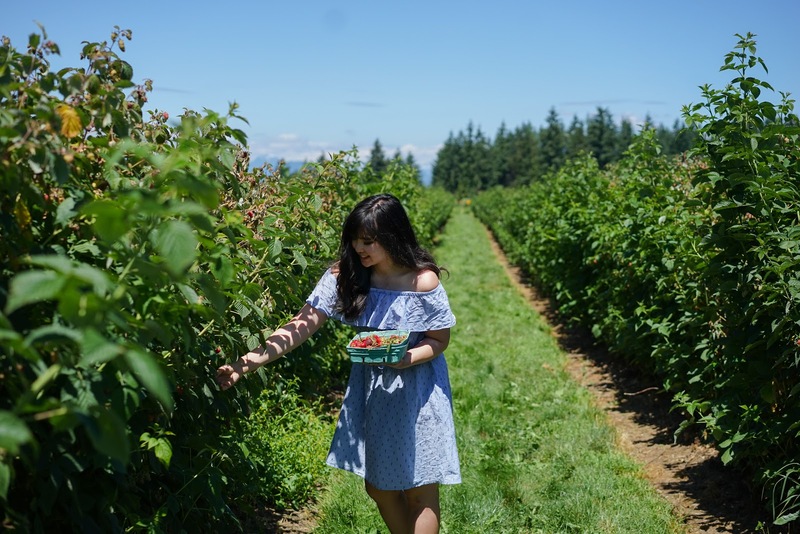 So we went out Sunday morning, grabbed some iced coffees for the road, and drove to the berry farm in Langley, BC. It was really hot that day, which I did not really mind because it made the berry ice cream afterwards even more of a treat. 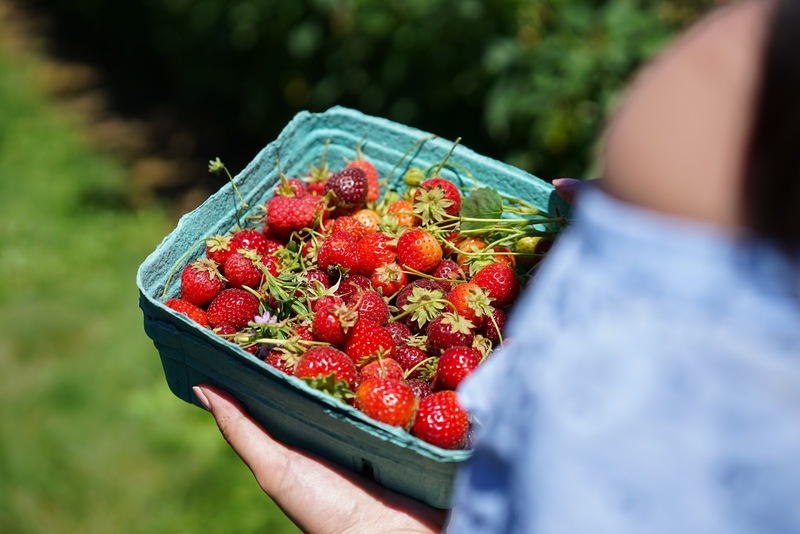 We started our berry picking adventure with some strawberry picking (there were juuuust enough left! 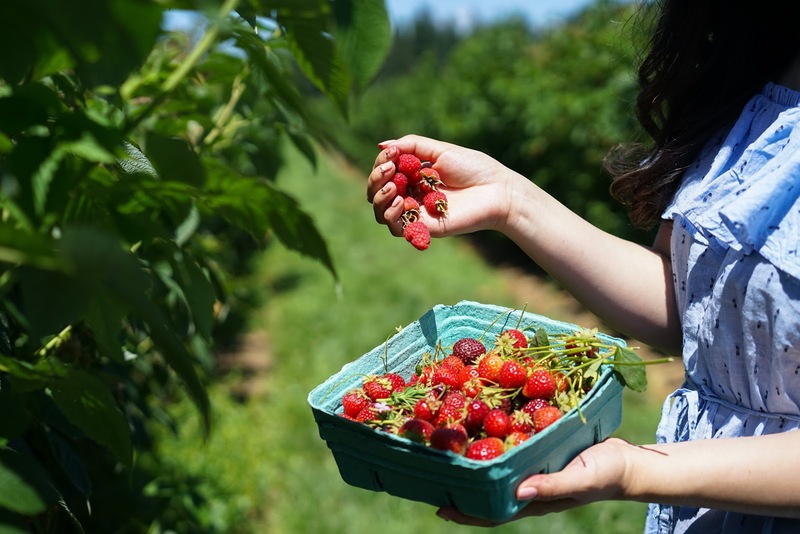 ), then raspberry picking, and then picking out berries we wanted to buy at the farm market. I was ecstatic when I saw that they were selling red currants at the market because I have been looking for them since last summer! 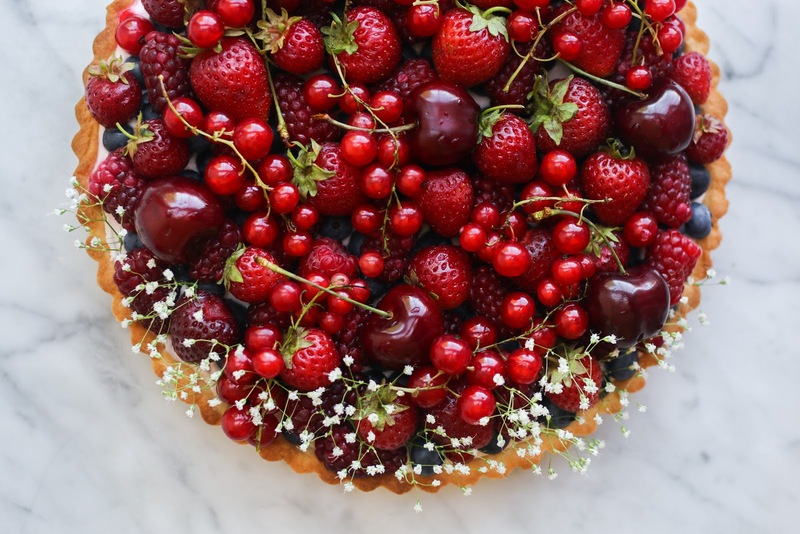 I have always wanted to decorate a cake, a tart, or anything really, with currants ever since seeing them in some cookbooks and online recipes. 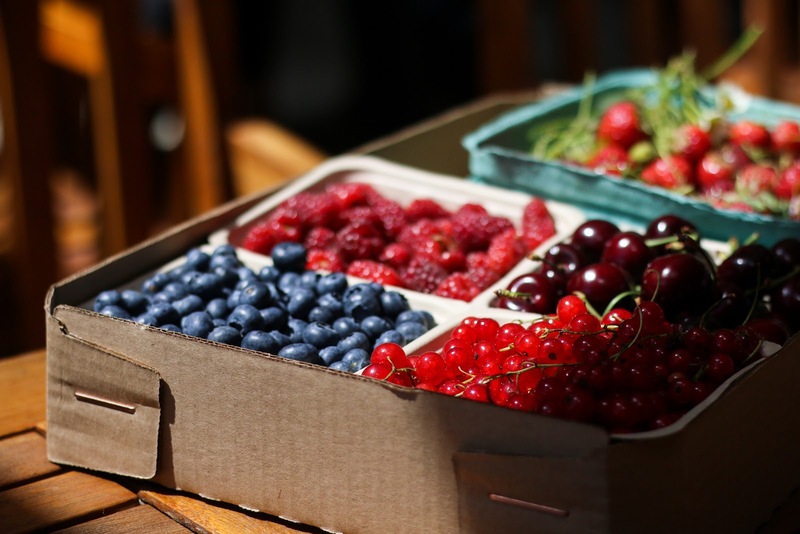 In addition to the strawberries and raspberries we picked, we bought blueberries, tayberries, cherries, and currants. Oh, we also picked up some berry glazed donuts because it only seemed right to do so. 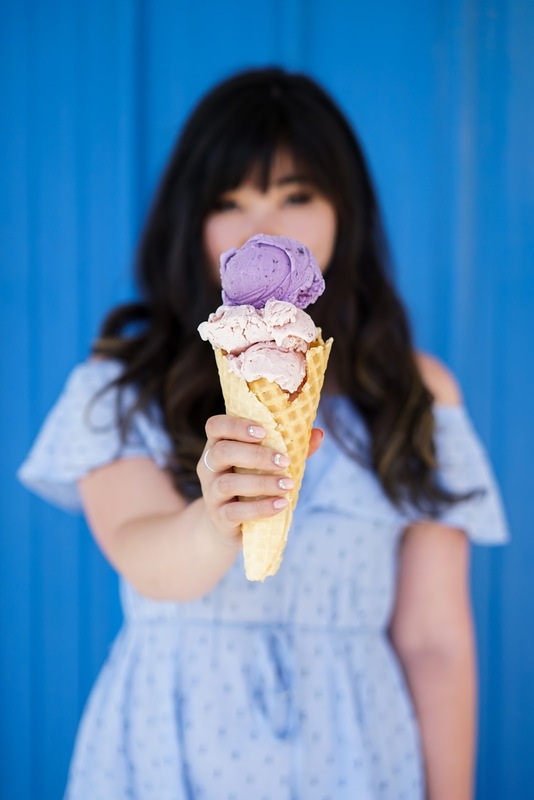 We had the largest corn pizza for lunch and finished off our farm day with a scoop of blueberry ice cream and a scoop of strawberry ice cream nestled in a waffle cone. 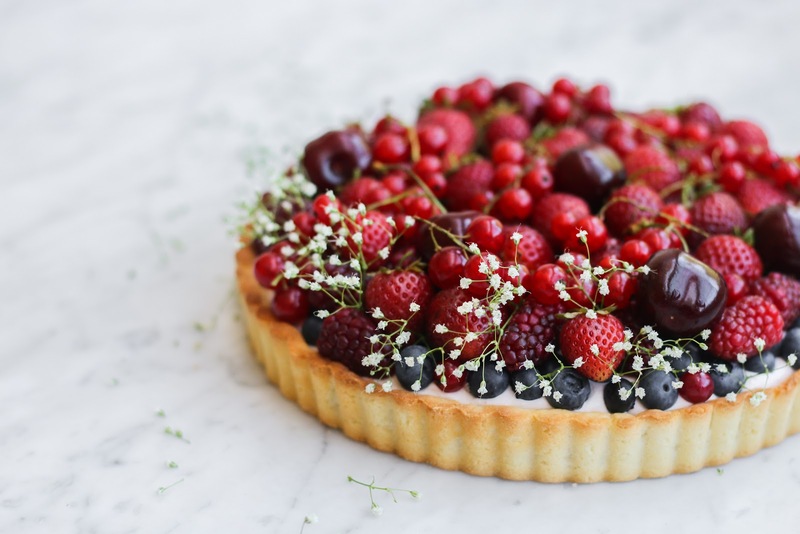 This tart was made with all the berries we picked up from the farm. It is a classic pâte sablée tart shell filled with the dreamiest whipped strawberry cream cheese filling. 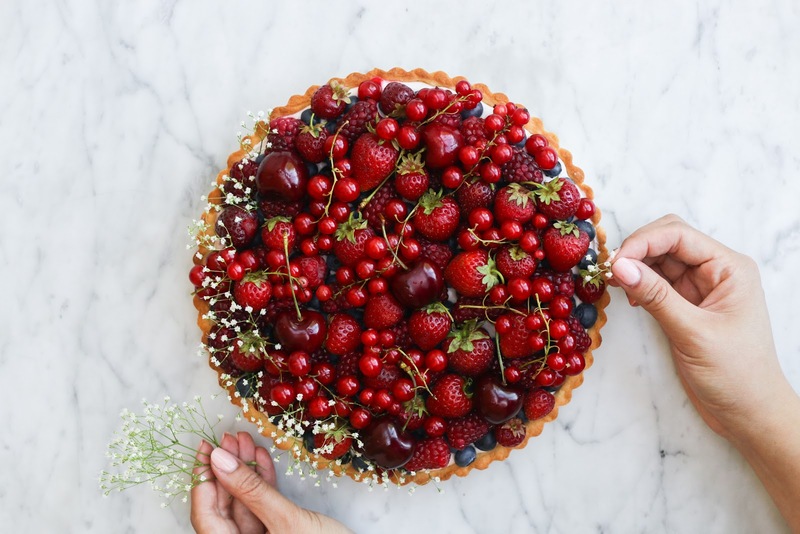 The most luscious and vibrant berries are what makes this tart a real pièce de resistance. 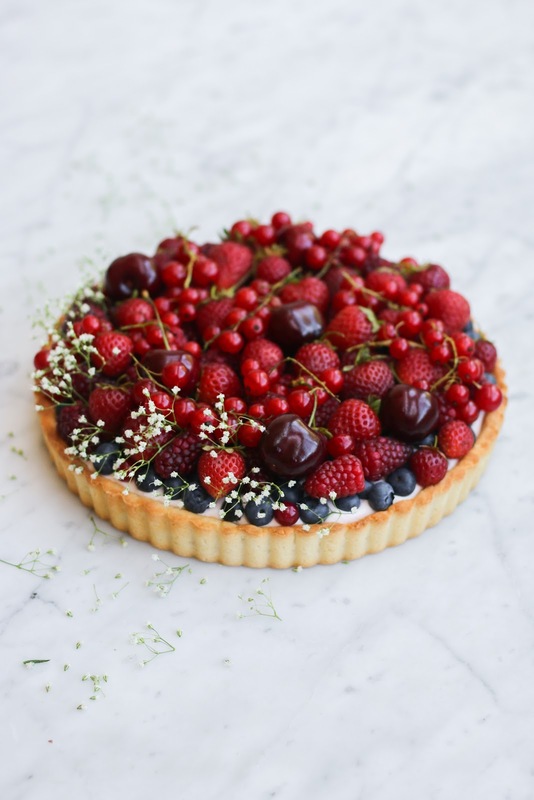 This tart would be just as delicious topped with any fruit that is in season. I think ripe peaches with this silky strawberry filling would be a real winner too. 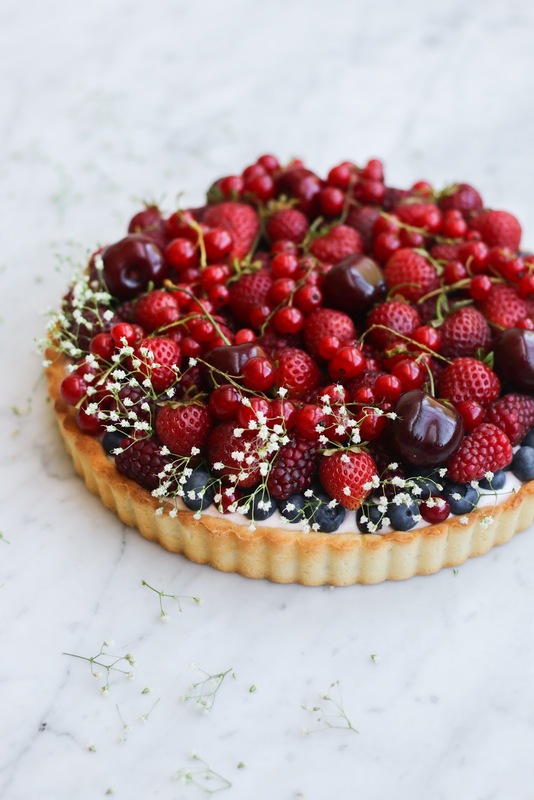 The next variation of this tart I am going tot make? Probably a fig and strawberry type of situation. Bake the tart shell at 410F or until the crust is golden brown (approximately 15 minutes). Remove carefully from oven and let rest on a wire rack. Let cool completely before filling with whipped cream cheese filling. Pour whipping cream into bowl of standing mixer. With the whisk attachment whisk the whipping cream until it becomes fluffy and forms medium peaks. Transfer whipped cream into a different bowl. With a paddle attachment on your mixer, beat cream cheese until light and fluffy. Gradually add in three tablespoons of strawberry jam and freeze-dried strawberry powder, beat for 2 - 3 minutes. In the same bowl, gently fold in the whipped cream. Fill cooled tart shell with strawberry cream cheese filling. 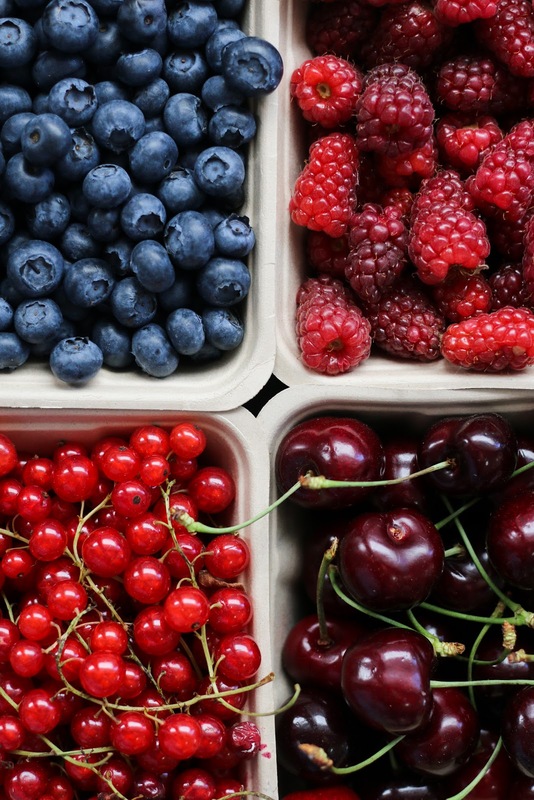 Garnish with fresh berries. Chill tart for 2 - 3 hours before serving.